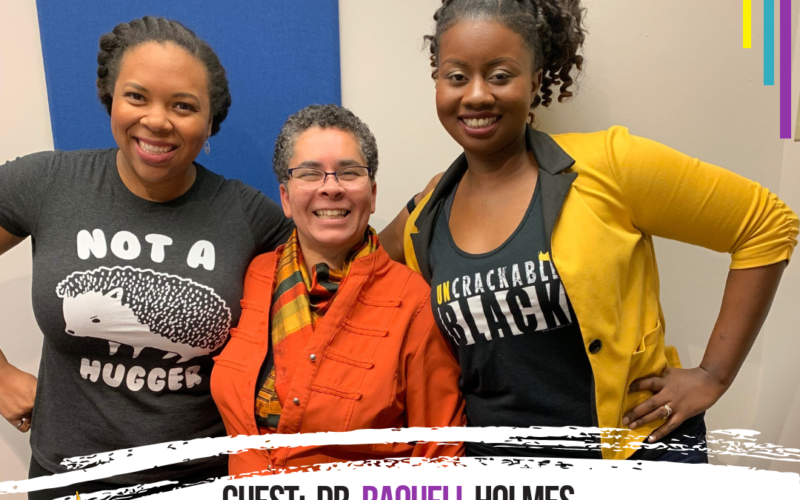 From biology to biomedical research, and ultimately high performance computing, Dr. Raquell Holmes has had a very “circuitous” journey. With parents in computing, a career in CS was a natural fit for Dr. Day. Math was her favorite subject because she could check her answers. She was developing websites in middle school and by the time she reached HS she knew she wanted to attain a PhD. Dr. Day is the first woman to receive a PhD from NCA&T. 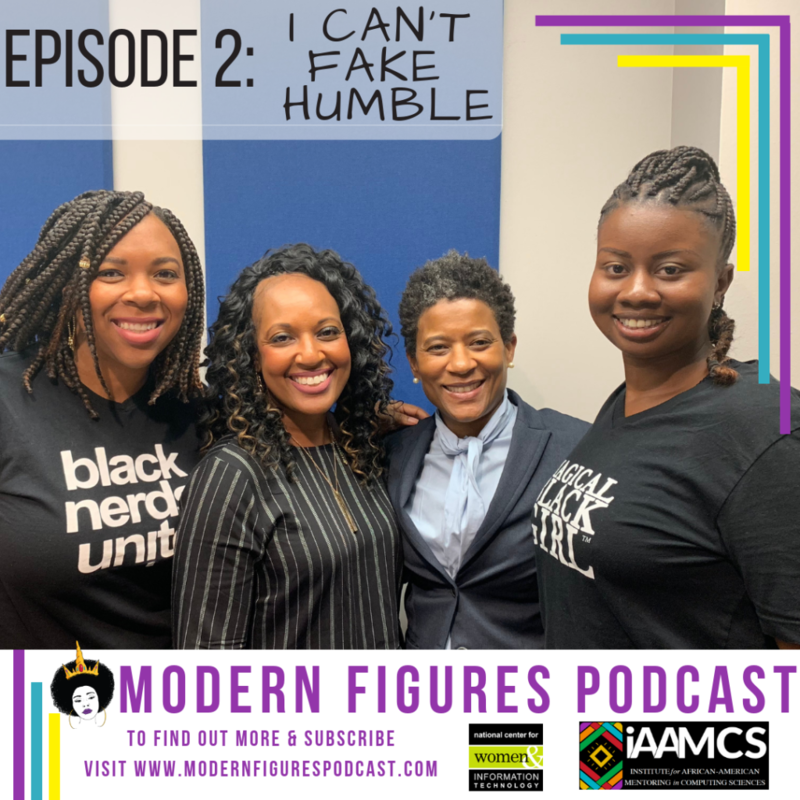 In this episode, you’ll learn how faith, determination, and hard work are what she believes led to her success. And she shares the importance of having multiple mentors, which may even include your parents. 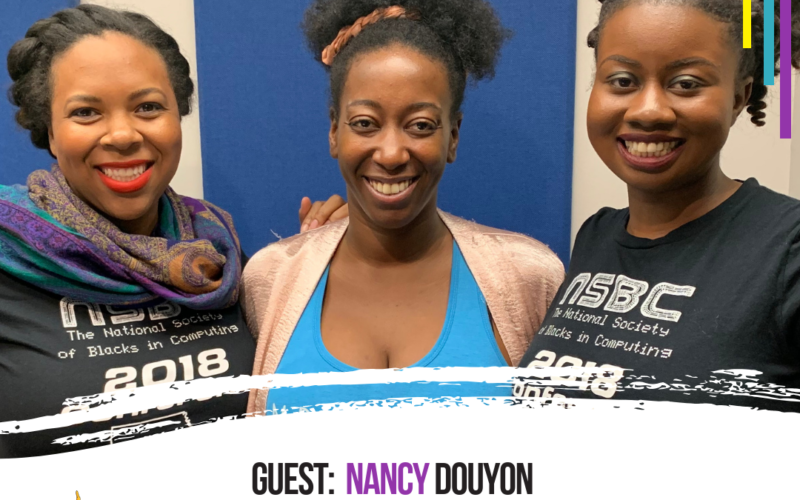 In this episode, Nancy schools us on the importance of inclusive UX (user experience) design and adapting technology to have a conscience. It’s impossible to design for a population that you don’t seek to understand, and she has made this her brand. 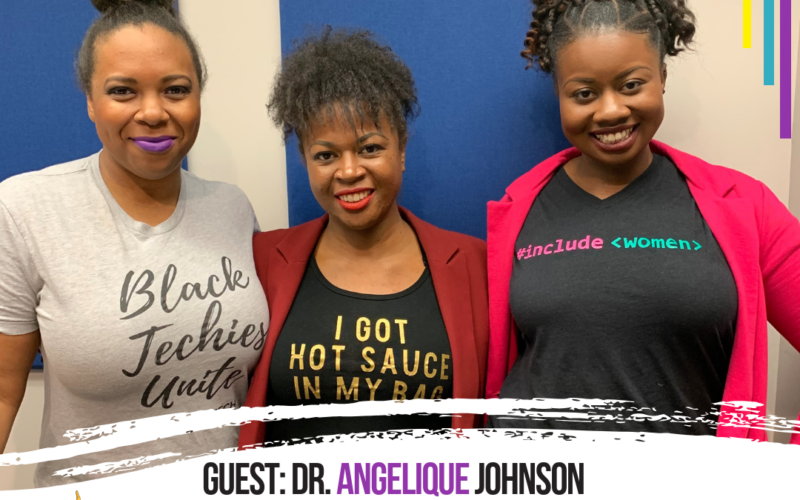 In this episode you’ll meet Dr. Angelique Johnson, Founder and CEO of MemStim. Learn what its like starting and running a company that combines computing and medicine to develop microelectromechanical systems (MEMS) for cochlear implants. She shares some of her strategies for pitching to investors and gaining business skills. She describes why she turned down funding from an investor because she kept in mind the golden rule: he who holds the gold makes the rules. 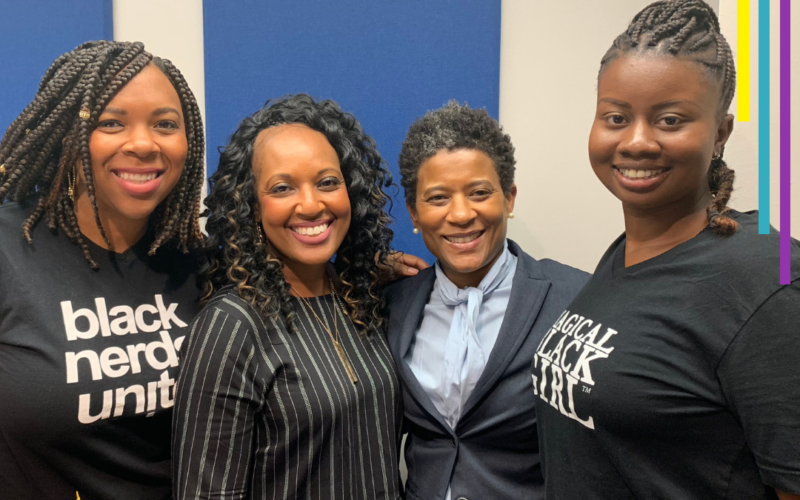 We (of course) also talk about who Dr. Johnson is, including her chrome dipped nails and faux hawk hairstyle and the importance of expressing her individuality at work. From math to CS, Jamie has experienced several transitions along her educational journey. In this episode, we dive deep into what it’s like to be a graduate student. Learn how her love for video games inspired her to pursue research. Jamie believes programming is an art form. And as the developer of Lyrics 2 Code, she encapsulates her creative ability by coding small, impactful lyrics. Warning: this episode is filled with lots of laughs. Description: : Roots. Rome. Religion. And Black Girl Magic. 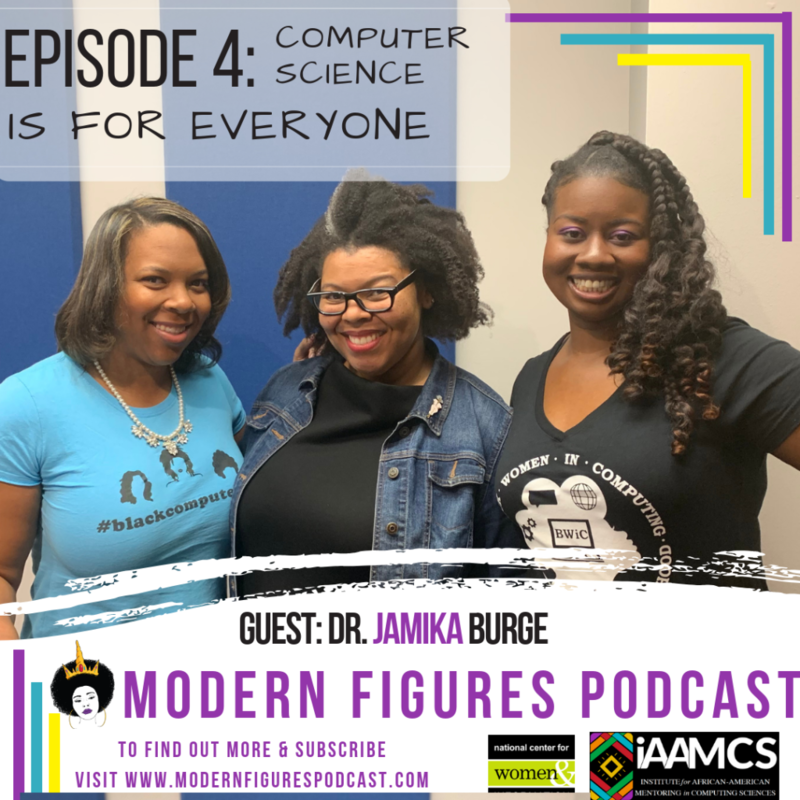 Listen in as Dr. Jamika Burge describes what mentorship means to her. 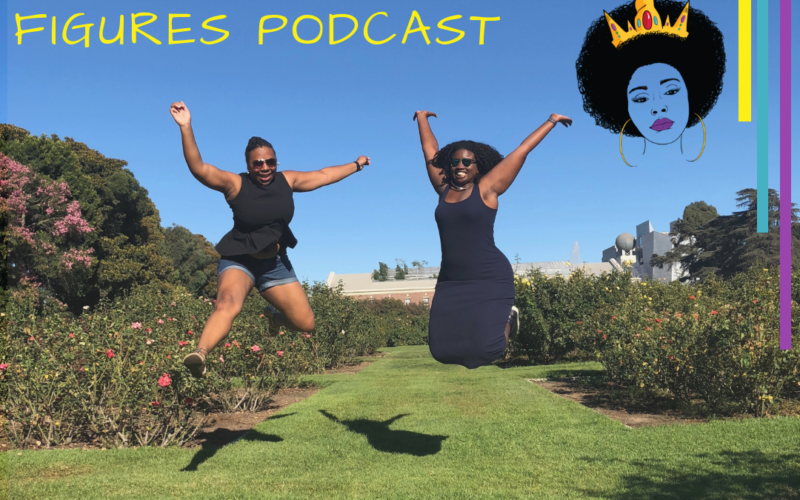 She’s a self-described “big city girl with a country heart” who used the knowledge she gained from attending HBCUs to leverage tech as a vehicle for her success. Dr. Jamika D. Burge is a Senior Manager at Capital One, where she oversees research curriculum development and internal/external outreach. At Capital One, she ideates and creates innovative user research curricula that empower designers, developers, and engineers to apply design thinking and human-centered design principles into their daily work, and beyond. She also engages with internal and external organizations in computing and design outreach activities. 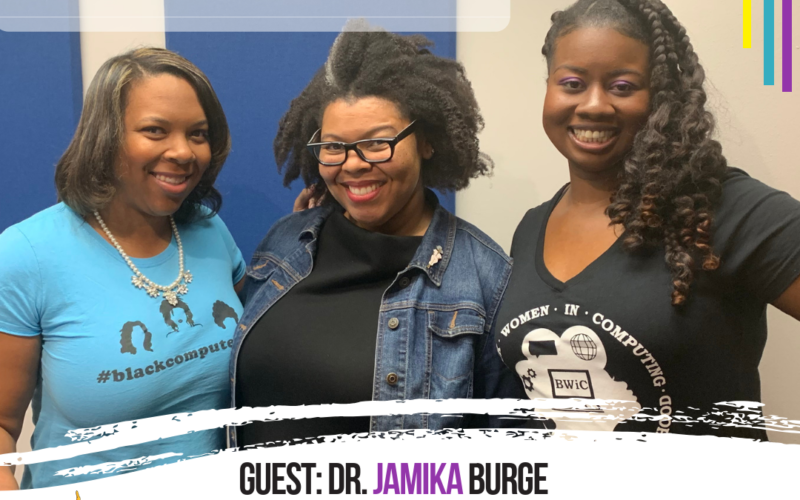 Prior to joining Capital One, Jamika served non-profit and government organizations, including as a consultant to the Defense Advanced Research Projects Agency (DARPA) in the Information Innovation Office (I2O). She provided technical and management consult for innovative DARPA programs which were funded at over $70 million. Her research interests lie in human-computer interaction (HCI), specifically in the design of technologies that support a range of communication and interaction needs. She is active in computer science education and STEM preparedness efforts, providing expertise for a host of funded programs funded by the National Science Foundation (NSF) and the Computing Research Association (CRA), particularly those seeking to broaden participation in computer science. She also provides insight and research into the layers of intersectionality that affect black women and girls in computer science. Jamika holds a Ph.D. in computer science, with a focus on human-computer interaction (HCI) from Virginia Polytechnic Institute and State University, where she was an IBM Research Fellow. Dr. Burge is also Founder and Principal of Design & Technology Concepts (DTC), LLC, where she focuses on computer science design and education research. To date, DTC has consulted for Google, the National Center for Women in Information Technology (NCWIT), and the American Association of College & Universities (AAC&U), among other organizations. 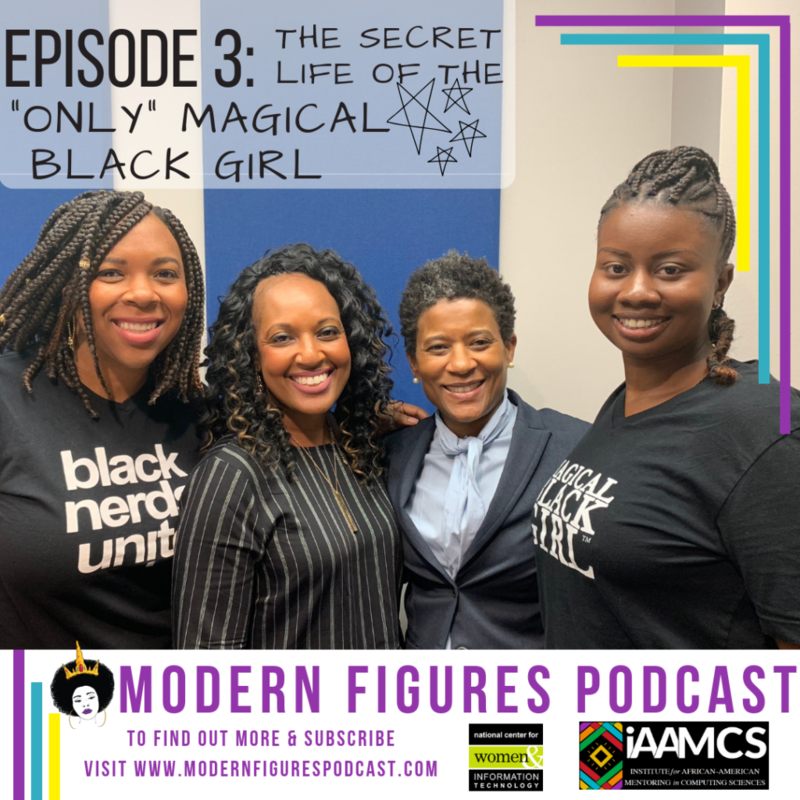 Her career has also included positions across academic (Spelman College and Howard University), non-profit (Smarter Balanced at UCLA), and industry (IBM Research) sectors. Description: True support for underrepresented science, technology, engineering, mathematics, and computing students in higher education is rare. To combat issues of access, equity, and inclusion, Dr. Stacie LeSure created Engineers 4 Equity. 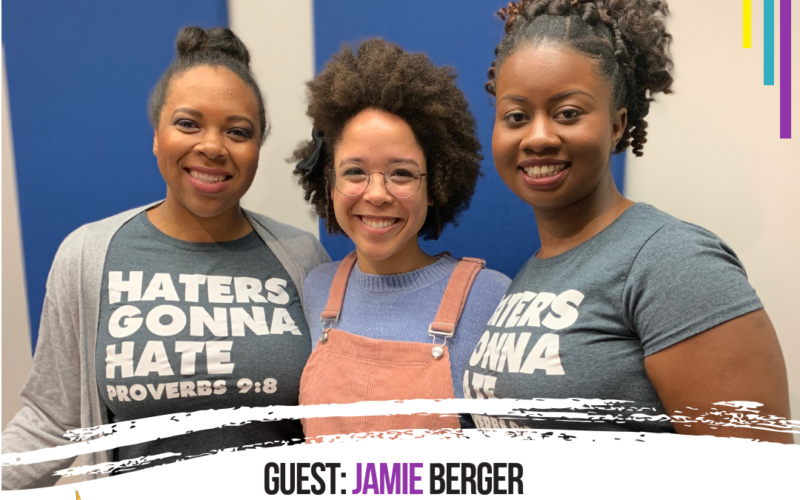 In this episode, we encourage you not to fake humble and take control of your personal story. 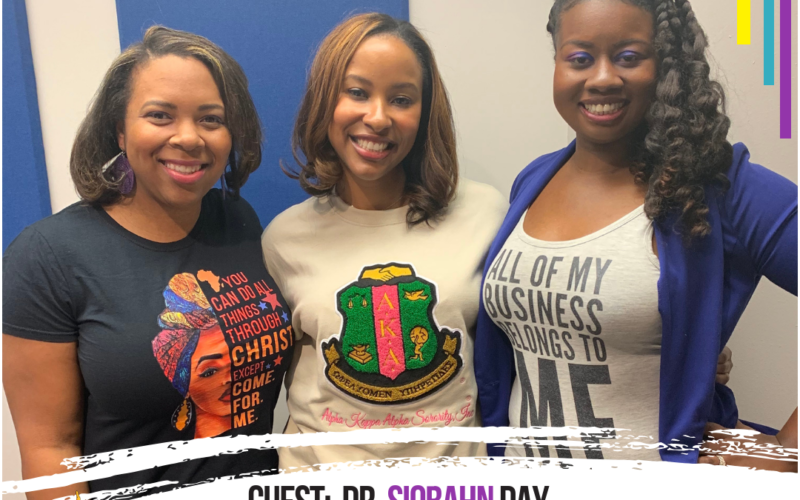 Dr. Stacie LeSure earned a Ph.D. in Engineering Education at Utah State University where her doctoral research applied Critical Race Theory and Intersectionality frameworks to critically examine effective intervention strategies to reduce the negative consequences of Stereotype Threat. She also has a Master of Science in Materials Science and Engineering from Georgia Institute of Technology and a Bachelor of Science in Physics from Spelman College. Dr. LeSure obtained the status of ABD (All But Defense) in Materials Science and Engineering at North Carolina State University. She is the founder and Executive Director of Engineers for Equity- a mission-driven organization focused on fostering equity and inclusion in engineering. Dr. LeSure also serves as Program Director and Senior Researcher at the Howard University Science, Engineering and Mathematics Center (HUSEM). At HUSEM she manages various research projects focused on the academic perceptions and persistence of students in STEM, particularly those students who are traditionally under-represented in STEM careers. Prior to joining Howard, she served as a Research Fellow at the American Association of University Women (AAUW) and a Post-doctoral researcher at the American Society for Engineering Education. Dr. LeSure worked as an engineer for over a decade before switching gears and devoting her time and talents to focus on pertinent issues including STEM education, equity and inclusion initiatives in education and the STEM workforce, and corporate development and training. 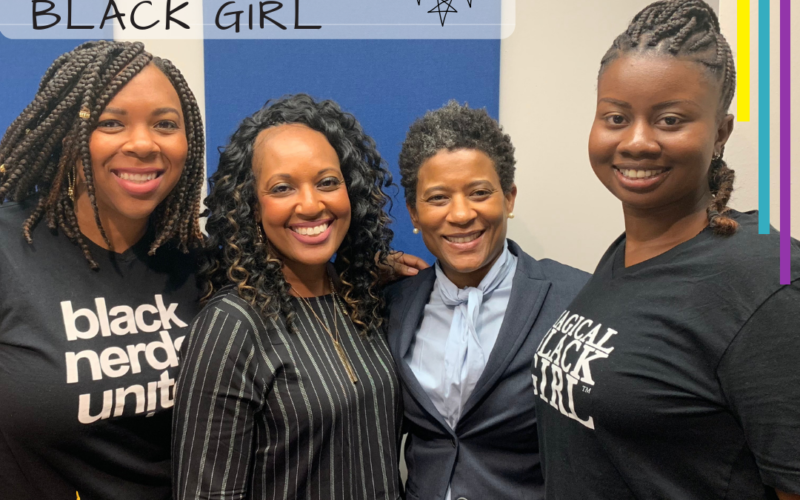 She is also the founder and Executive Director of Engineers for Equity- a mission-driven organization focused on fostering equity and inclusion in engineering. Black women were pioneers in various fields of computing, but it’s often hard to find their stories, even today. 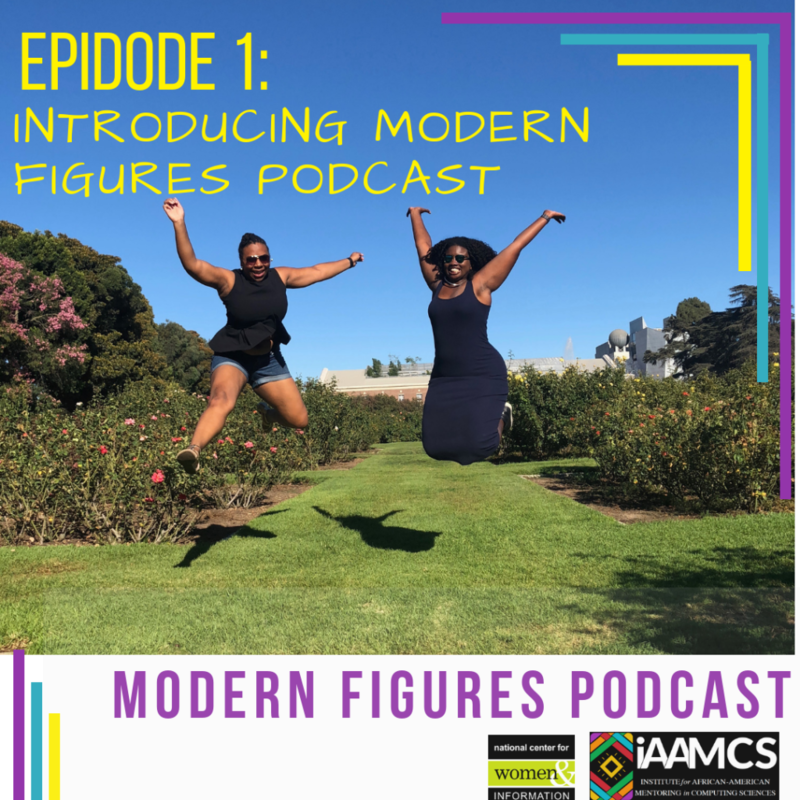 This episode introduces Modern Figures Podcast and begins the story of how we will elevate the voices of Black women in computing to inspire the next generation of the advanced technology workforce.